Do you ever wonder about the work that goes into turning one of our properties from a ‘before’ into an ‘after’? Architect Grainne Shaffrey recently gave a fascinating talk about her work on our Merrion Mews, in association with the Irish Architecture Foundation. 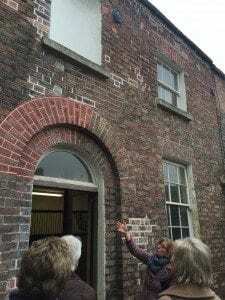 During a guided tour for Irish Architecture Foundation members and Irish Landmarkers, Grainne walked us through Merrion Mews, giving us a chance to learn about the work involved in restoring the property to the comfortable guest accommodation that we know today. It was an opportunity for some illuminating insights into the thoughts and processes that happen before most of us ever step foot into an Irish Landmark Trust building. Grainne’s passion for her work and her stories from Merrion Mews were very well received by all who attended. Details of the property’s history can be found here.